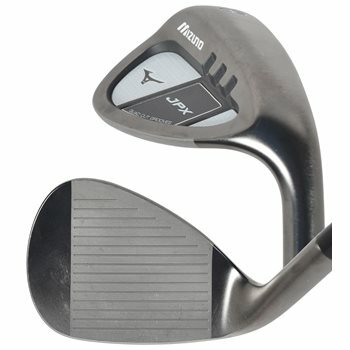 The Mizuno JPX Black Nickel wedge features Condition of Competition Quad Cut Grooves and a CNC milled face, resulting in maximum spin under all conditions. This wedge series offers loft specific groove technology where the higher lofted wedges (56*-60*) have wider and shallower grooves for added spin on shorts shots and the lower lofted wedges (50*-54*) have deeper and shallower grooves for more control on full shots. The smooth cambered sole design delivers more effective bounce for ideal turf interaction and syncs perfectly with JPX iron models. >>QUAD CUT Groove: Maximises 4 dimensions within new R&A / USGA guidelines. >>Loft Specific Grooves: Wider shallower grooves on high lofts (56*- 60*), deep narrow grooves on lower lofts (50*- 54*). >>Smooth cambered sole: More effective bounce for ease of use. >>CNC Milled face: Increased friction for maximum spin in shorter shots around the green. >>Harmonic Impact Technology (HIT): Engineered for solid, pure feel. >>Black Ni finish: Reduces glare from lofted face. Is there a standard bounce? How will a low bounce differ in play from a higher bounce? A lower bounce will tend to dig more into the turf and is better for firmer conditions and players who tend to pick the ball. A higher bounce will tend to bounce off the turf. Typically better for wetter conditions and players who take large divots. There is not a standard bounce.